The ASSOCIATES of IAF present our annual APPRECIATION NIGHT. It is our time to thank the people at Idyllwild Arts for their hard work and dedication. 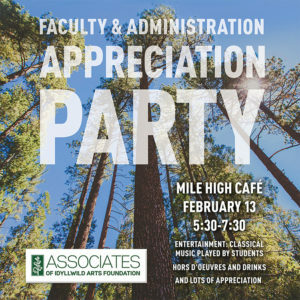 This event is open to all current Associates and the faculty, leadership, administration, and invited guests of the Idyllwild Arts Academy & Summer Program. Not a member but would like to attend? Join by following the MEMBERSHIP tab above.